Attach this malleable anesthesia screen frame to virtually any operating table, then shape as desired. Mounting post fits into a standard side rail socket. Anesthesia screens can be used to block the anesthesia field from the patient's line of sight, eliminating patient anxiety and the distractions that can come from viewing the anesthesiologist's movements. These screens are also used to separate the anesthesia field from the surgical site, thus reducing the risk of contamination. 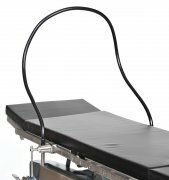 A flexible frame is used with a sheet that can be suspended anywhere along the length of the patient's body.